November 16, 2017 at the Hilton St. Petersburg Carillon Park. On May 4, 2018, the Florida Department of Transportation (FDOT), pursuant to 23 U.S. C. §327 and a Memorandum of Understanding dated December 14, 2016 and executed by the Federal Highway Administration and FDOT, granted Location and Design Concept Acceptance for: WPI Segment Number: 422799-1, Project Development and Environment (PD&E) Study for the Replacement of the Northbound Howard Frankland Bridge (I-275/SR 93) in Pinellas and Hillsborough Counties. 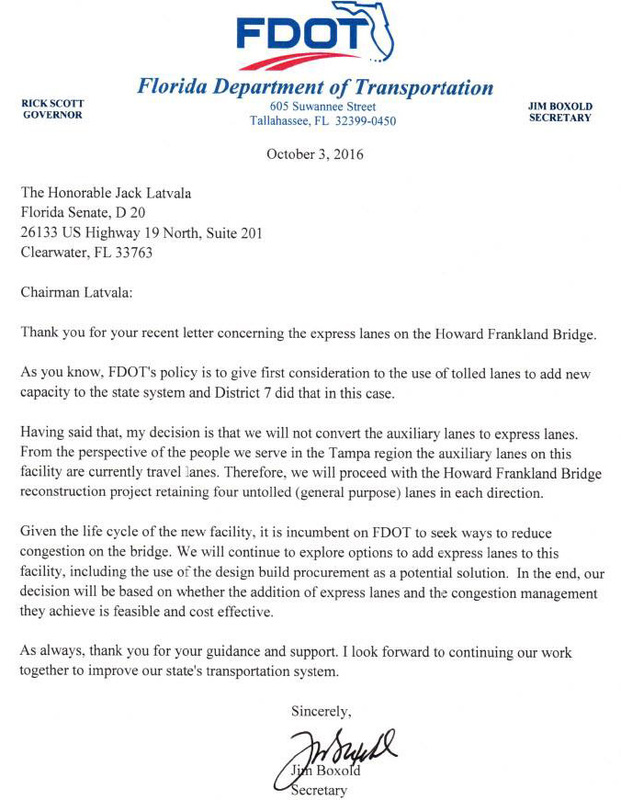 Click here to view a letter from Jim Boxold to Jack Latvala concerning the express lanes on the Howard Frankland Bridge. The Florida Department of Transportation (FDOT) has plans in motion to replace the aging northbound/eastbound portion of the Howard Frankland Bridge, which is approaching the end of its’ serviceable life. A Project Development and Environment (PD&E) Study is currently underway to identify the best replacement options and document how the replacement will affect the surrounding environment. 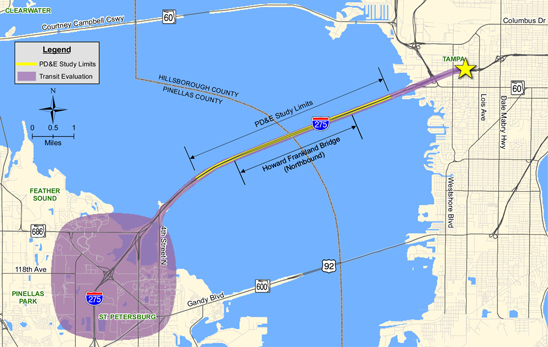 In addition to the bridge replacement study, a key element of the Tampa Bay Area Regional Transportation Authority (TBARTA) Master Plan is to develop a transit connection across the Howard Frankland Bridge that will link Pinellas and Hillsborough counties via transit stations. The linkage provided between Pinellas County’s proposed Gateway Station and Hillsborough County’s Westshore Regional Multimodal Center will allow uninterrupted transit movements along the bridge. For this to be possible, however, the corridor must be capable of accommodating the appropriate transit provisions. 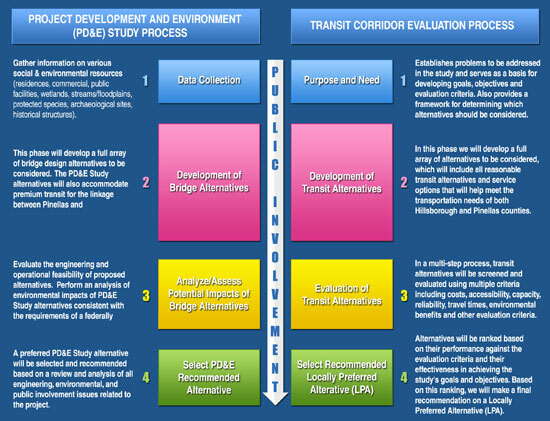 Therefore, we will also conduct a Transit Corridor Evaluation Study to determine opportunities and constraints of providing a potential transit envelope in conjunction with bridge replacement. While the primary purpose of the PD&E study is to examine replacement of the bridge without increasing capacity, the transit study will examine how transit could be included in the bridge replacement construction. The transit study will examine engineering constraints and develop feasible alternatives to accommodate transit in the design of the replacement bridge, or determine if a new structure would be required. The study will review data gathered during the Pinellas County Alternatives Analysis (AA), which looked at providing premium transit service from Pinellas County to Hillsborough County. The study will also analyze data from the Westshore Multimodal Center Study. 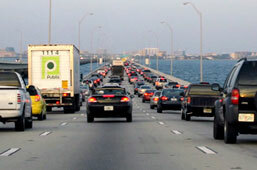 The Howard Frankland Bridge corridor must accommodate the appropriate transit provisions to connect all transit systems regionally. Move your mouse cursor over the Howard Frankland Bridge to view an aerial photo. The Howard Frankland Bridge is the central bridge spanning Old Tampa Bay from Clearwater/St. Petersburg to Tampa, Florida. It is one of three bridges connecting Pinellas County and Hillsborough County; the others being the Gandy Bridge and the Courtney Campbell Causeway. The Howard Frankland carries I-275 and is by far the most traveled of the bay area bridges; carrying an average of 139,000 vehicles per day across Tampa Bay. 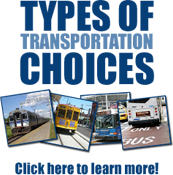 Given the importance of this connection, regional planning agencies such as the Tampa Bay Area Regional Transportation Authority (TBARTA) have developed multi-county transportation plans. Agencies like TBARTA and FDOT have been tasked with looking beyond county-specific congestion issues. State leaders are recognizing that traffic congestion does not start or stop at county lines nor do the solutions. That is why TBARTA’s Transportation Master Plan – which encompasses Citrus, Hernando, Pasco, Hillsborough, Pinellas, Manatee, and Sarasota Counties – has placed the Howard Frankland Bridge on its list of priority projects. As a first step in moving toward implementation of the TBARTA Master Plan two transit studies were conducted. The Hillsborough Area Regional Transit Authority (HART) conducted an alternative analysis (AA) for a light rail transit corridor running from the University of South Florida, through downtown Tampa, to the Westshore area. The second AA was conducted by TBARTA, FDOT, the Pinellas County Metropolitan Planning Organization (MPO) and the Pinellas Suncoast Transit Authority (PSTA) to evaluate the type and location of a premium transit corridor connecting downtown St. Petersburg, through the Pinellas Gateway area, and Clearwater. The Howard Frankland Bridge Transit Corridor Evaluation is vitally important as it will link these two transportation efforts as it connects Pinellas and Hillsborough Counties.